Traditions Page Lucia Songs "Sankta Lucia"
In Sweden, Denmark, Norway and Finland, Lucy (called Lucia) is venerated on December 13 in a ceremony where the eldest girl in a family, portraying Lucia, walks, with a crown of candles, ahead of a procession of other women holding a candle each. The candles symbolize the fire that refused to take her life. The women sing a Lucia song while entering the room, to the melody of the traditional Neapolitan song Santa Lucia, still well-known through the recording by Enrico Caruso but, whereas the Italian lyrics describe the beautiful view from the harbour area Santa Lucia in Naples, the various Scandinavian lyrics are fashioned for the occasion, describing the light with which Lucia overcomes the darkness. Each Scandinavian country has their own lyrics in their native tongues although commonly it is the melody of Neapolitan which is used. After finishing this song, the procession usually continue by singing Christmas carols or more songs about Lucia. 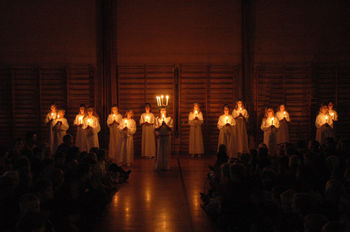 When the Scandinavian countries were Catholic, the night of Lucia was celebrated just as many other saints' days were. However, the tradition would continue to live on even after the reformation in the 1530s. According to the Julian calendar the night of Lucia was the longest night of the year. This is likely to be the reason why the tradition has lived on in the Nordic countries in particular, as the nights in November and December are very dark and long before the snow has fallen, and the idea of light overcoming darkness is thus appealing. Some trace the “re-birth” of the Lucia celebrations in Sweden to the tradition in German Protestant families of having girls dressed as angelic Christ children, handing out Christmas presents. The Swedish variant of this white-dressed “Kindchen Jesus”, or Christkind, was called “Kinken Jes”, and started to appear in upper-class families in the 1700s on Christmas Eve with a candle-wreath in her hair, handing out candy and cakes to the children. Another theory claims that the Lucia celebration evolved from old Swedish traditions of “star boys” and white-dressed angels singing Christmas carols at different events during Advent and Christmas. In either case, the current tradition of having a white-dressed lady with candles in her hair appearing on the morning of the Lucia day started in the area around Lake Vänern in the late 1700s and spread slowly to other parts of the country. The modern tradition of having public Lucia processions in the Swedish cities started in 1927 when a newspaper in Stockholm elected an official Lucia for Stockholm that year. The initiative was then followed around the country through the local press. 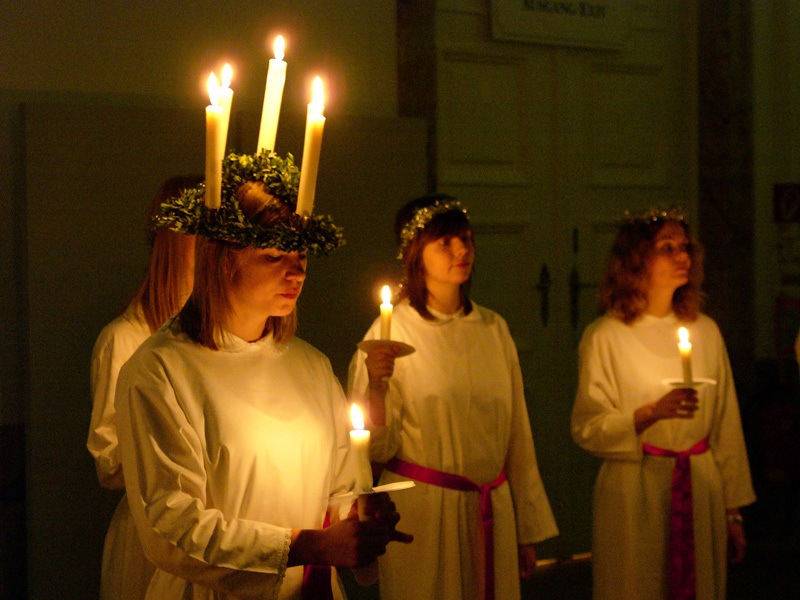 Today most cities in Sweden appoint a Lucia every year; schools elect a Lucia and her maids among the students; and a national Lucia is elected on national television from regional winners. The regional Lucias will usually visit local shopping malls, old people's homes and churches, singing and handing out ginger snaps. Recently there was some discussion whether it was suitable if the national Lucia was not a blonde Caucasian, but it was decided that ethnicity should not be a problem, and in the year 2000 an adopted non-white girl was crowned the national Lucia. There are now also boys in the procession, playing different roles associated with Christmas. 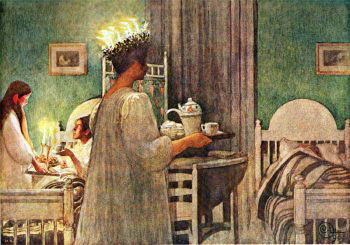 Some may be dressed in the same kind of white robe, but with a coneshaped hat decorated with golden stars, called "stjärngossar" (star boys); some may be dressed up as "tomtenissar", carrying lanterns; and some may be dressed up as gingerbread men. They participate in the singing and also have a song or two of their own, usually Dtaffan Stalledräng, which tells the story about Saint Stephen, the first Christian martyr, caring for his five horses. In Denmark the Day of Lucia (’’Luciadag’’) was first celebrated December 13, 1944. The tradition was directly imported from Sweden by initiative of Franz Wend, secretary of Föreningen Norden, as an attempt to “bring light in a time of darkness”. Implicitly it was meant as a passive protest against German occupation during the Second World War but it has been a tradition ever since. Although the tradition is imported from Sweden it differs somewhat in that the celebration has always been strongly centred on Christianity and it is a yearly local event in most churches in connection with Christmas. Schools and kindergartens also use the occasion to celebrate the event as a special day for children on one of the final days before the Christmas holidays but it does not have much impact anywhere else in society. Although not widely observed there are a number of additional historical traditions connected with the celebration. The night before candles are lit and all electrical light are turned off and on the Sunday closest to December 13 you go to church. The Danish versions of the Neapolitan song clearly reflect the close connection to christianity. The best known version is Holger Lissners version from 1982, ‘’Sankta Lucia’’.